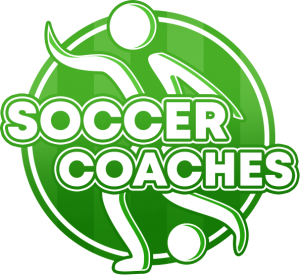 Goal: This soccer passing exercise focuses on performing and preparing penetrating passes with receiving and combinations. 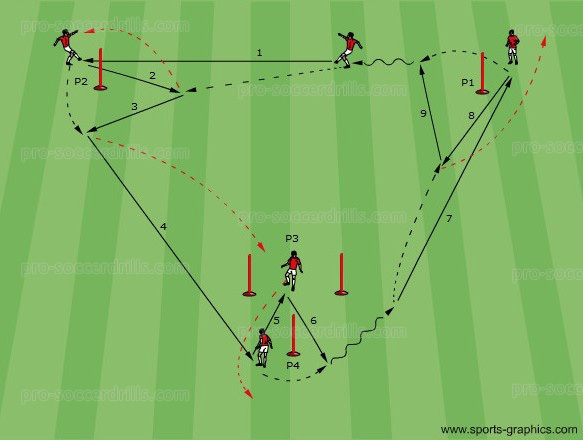 This soccer drill also helps develop head orientation, awareness, vision, rhythm and performing the correct pace and angle of passes. Cones are used to mark the players’ positions. Sticks are placed to draw the passing channels. Distances must be created according to the given age-group. Players change their positions continuously following their passes. 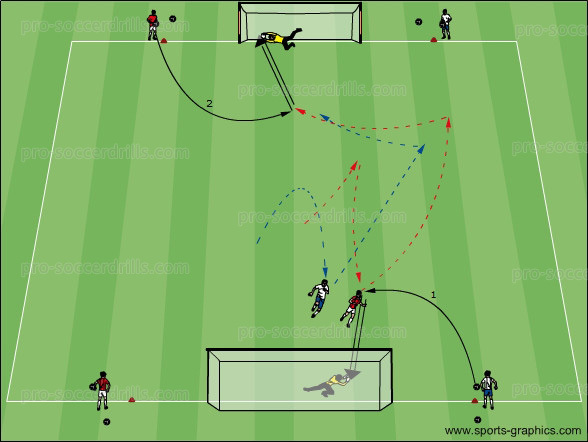 Players perform this soccer passing exercise with two balls simultaneously. 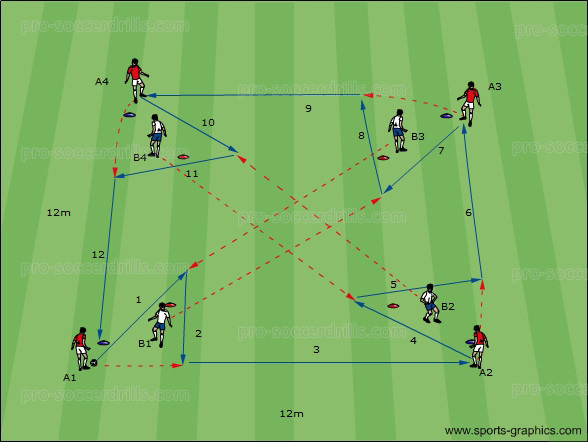 Players start this soccer passing drill from positions A. Two variations are performed. Players start performing their movements from the given positions and combine with each other according to the two variations. Player B approaches and combines with Player A to get back the second pass from Player A in angle (3). 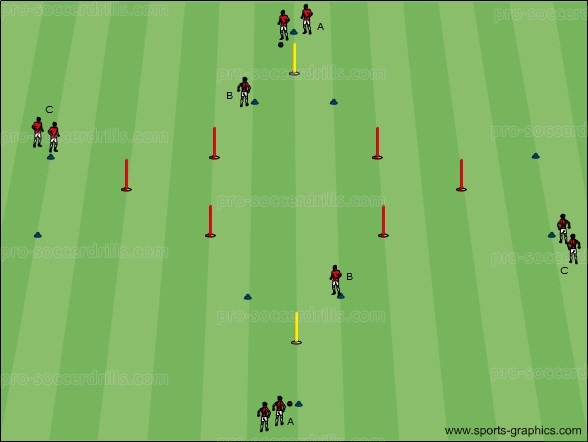 Player B receives the ball in an open body position and dribbles (4)laterally to open the passing channel and performs a well weighted pass (5) to Player C. Player C starts to sprint to the space when Player B dribbles. Player A passes (1) to Player B who lays the ball back (3) in angle to open the passing channel. 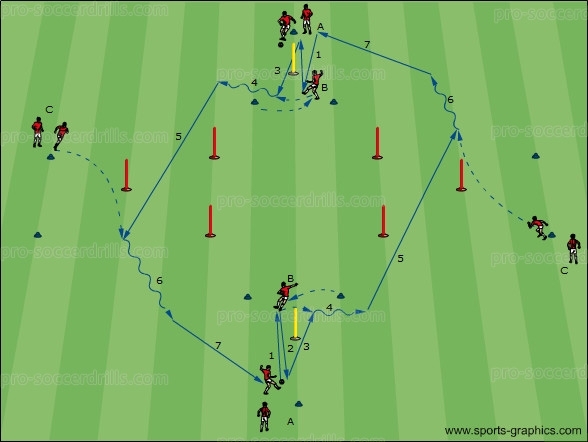 Player A passes (3) a long penetrating pass directly to Player C. The keypoints of these combinations are the following: the position of Player B’s lay down, the movements of Player C and the pace and angle of the penetrating pass (3).